Medo pumps feature a linear-motor-driven free piston system ideal for wastewater treatment and aquaculture industries. This linear-piston design eliminates wear on components. The only moving part is the piston. Note: Select Medo model to view pump specifications. 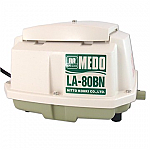 Medo linear air pumps come with a 1-year manufacturer's warranty.